Behavioral science and psychology can help explain the underlying reasons for seemingly irrational behavior which cities aim to address, such as using payday loans or committing property crimes. Unfortunately, determining the underlying causes of human behavior is difficult for a single individual, let alone an entire population. However, the vast amounts of data collected by cities has opened up new analyses that combine data science and behavioral science and enable cities to develop behaviorally-driven solutions to city-wide problems. South Bend, Indiana, faces one such behavioral situation. Every month, the city disconnects the water services of over 650 accounts due to persistent nonpayment of the account’s utility bill. Over the course of the year, 5,489 accounts – 11% of all accounts – have their water shut off at least once. 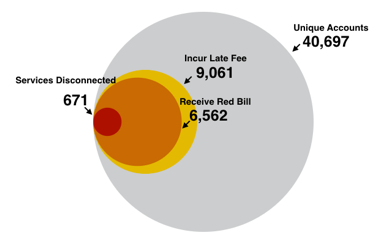 Though most accounts manage to pay the amount required to be reconnected within a day or two of disconnection, there are still significant costs to individuals and the city. Residents incur an additional fee due to disconnection (not to mention the inconvenience and stress of losing running water), and the city expends resources on turning the account’s water off and on and answering a large volume of 3-1-1 calls related to shut offs. In collaboration with South Bend’s Innovation and Public Works departments, we have used the city’s data to develop a deeper understanding of the human behavior that characterizes water shut offs and quantify the scale of the problem and its consequences. This work informed the design of a behaviorally-driven intervention aimed at lowering the frequency of late payments and shut offs, which will be tested by the city this summer. South Bend is a Rust Belt city of 100,000 people. The Public Works department provides utility services to over 40,000 unique accounts, where an account is defined by a pair of a unique payer and a unique location (a payer can have more than one location such as a landlord with multiple buildings). In examining historical data, we found that accounts can be divided into nested groups. On average during a single month, 78% of the city’s 40,000+ accounts pay by the bill due date, while 9,000+ accounts (22%) pay after the due date and thus incur a late fee. Of those delinquent accounts, the majority finally pay only after receiving two warning calls and a warning letter delivered over a series of weeks by the city, ultimately avoiding having their water disconnected by a matter of days. However, every month there are always about 650 to 680 accounts that fail to pay even by the last possible deadline, resulting in a water shut off. 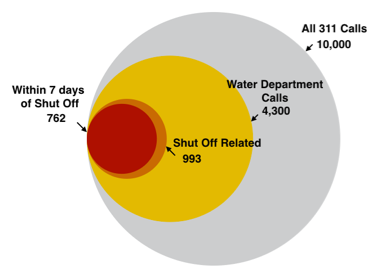 3-1-1 call data suggests that an information gap is one driver of water shut offs. Every month, 4,300 out of 10,000 3-1-1 calls to the city are directed to the water department. Of those calls, nearly 1,000 are directly related to water shut offs. Call transcripts indicate that city residents are consistently asking about the amount required to avoid a shut off and the date on which the shut off will occur. It is likely that there are other residents who also lack this information, but fail to make the call in time and consequently have their water shut off, incurring a cost for themselves and the city. We found that late payment is a chronic behavior. Twenty percent of accounts in the city paid late in five months or more in 2016. Shut offs, on the other hand, are more likely to be one-off incidents. Only 3.8% of accounts had their water shut off more than once in 2016. 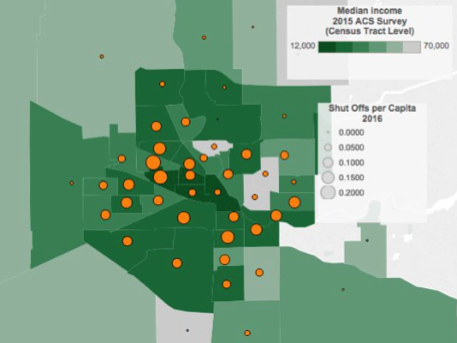 While we cannot precisely measure the socio-economic status of the accounts in the city, American Community Survey data shows that lower income areas experience more water shut offs. One census tract with a median income of $20,000 had 203 shut offs in 2016, whereas another with a median income of $60,000 only had 10. 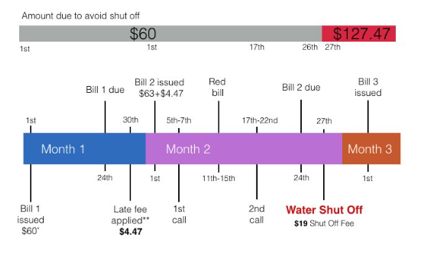 Once an account’s water is shut off, customers must pay more to turn it back on than they would have paid a day earlier to avoid the shut off in the first place. This increase is due to the city requiring the account to pay off the entirety of its outstanding balance, typically equivalent to two monthly bills, in order to have services restored. The data revealed that the majority of accounts make a payment immediately after disconnection, with 66% of accounts making a payment on the same day as disconnection in 2016. The average amount paid above and beyond the amount which would have been necessary to avoid the shut off in the first place is $79. These findings may seem like irrational behavior. Why would an account not pay one day earlier in order to avoid additional fees and service disconnection, if they are going to have to pay twice as much one day later? However, psychology tells us that this behavior should not be unexpected. As humans, we are both overly optimistic about future behavior and extremely responsive to incentives. We think we will pay the next day, but when the next day rolls around, we update our expectations and think we will pay the next day again. For a cash-strapped resident, the cost of paying a smaller amount today may seem higher than the cost of paying more tomorrow, due to the human tendency to discount the cost of an event in the future. In addition, the accounts which incur shut offs are more likely to pay by physically traveling to the city’s public works office and less likely to pay via a bank transfer, suggesting that access to credit is another factor which increases the true cost of payment for many residents. Changing the process by which accounts complete payments or are notified about the consequences of nonpayment can help accounts make more beneficial financial decisions, both for themselves and for the city. Nevertheless, individuals respond to incentives. The data suggests that disconnecting water is an effective incentive, but it is also very costly for both the city and the individual. Behavioral science suggests that there are better incentives that can be very effective in motivating payment with fewer associated costs. This intervention could include altering the language or appearance of the bill sent to customers in order to address over-optimism about future behavior or altering a step in the payment process in order to lower the effort required. With the foundational data analysis complete, the Behavioral Insights Team and the city of South Bend are currently working together to design the specific intervention which will be tested. Look out for another blog post once the intervention has been completed and we can see again what the data has to say. This program is run by the Center for Data Science and Public Policy at the University of Chicago which is a joint center between the Harris School of Public Policy and the Computation Institute. Copyright 2018 Data Science for Social Good | Center for Data Science and Public Policy, University of Chicago.